ALA is Selling a Dock With a Great Location. MBM5 Slip #22 is located in calm waters in Meadow Bay. Meadow Bay Multiple Dock 5 Slip #22 is a valuable end slip. Bathroom is nearby. Located near ALA Trail Access #35 or 36. Eligible Buyers are those qualified to own a boat slip right, dock and/or associated structures. Bulk dock right holders are not eligible. Eligible Buyers must pay in full with either cash, certified or cashier's check from a bank acceptable to ALA. Payment in full must be made within two business days of the award. The award will be made to the eligible Buyer making the highest bid at or above the reserve value. 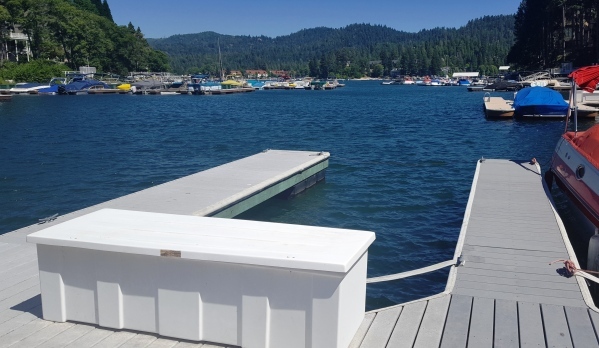 Interested Buyers must submit a sealed bid to the ALA office at 870 N. Highway 173, Lake Arrowhead, CA 92352 by 5:00 pm on Tuesday, July 31, 2018. The bids will be opened and the docks will be awarded on August 1, 2018.